As the trees start to bloom and Montclair residents are being pestered by season allergies, the perfect distraction is right around the corner. 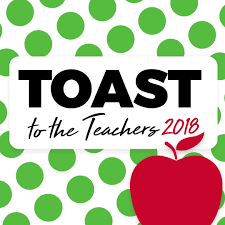 Around this time every year, the Montclair Fund for Education Excellence (MFEE) organizes a new season of Toast to the Teachers, honoring the best and most caring educators in the Montclair Public School district. Through the Toast to the Teachers, parents of MPS students can host parties which highlight these amazing teachers. Parties can be adults only, or fully inclusive of parents and kids alike, encouraging mingling throughout. When parents buy tickets or donate to the fundraiser, all of the proceeds go back into the MFEE, which then works to host amazing events throughout the school year, such as The MFEE Amazing Fundracer, The MFEE Showdown Montclair, and in addition, provides grants to different school programs. In addition, Montclair businesses are encouraged to donate to the MFEE. Much of the amazing accomplishments of the MFEE can be attributed to Masiel Rodriguez-Vars who serves as the Executive Director of the program. Rodriguez-Vars has acted as a transformative figure in this position, bringing an incredible level of organization and drive to the MFEE. The success of the fund under her careful eye has set the MFEE as a model for similar programs around the country also seeking to generate community support for educational programs. The Montclair Dispatch spoke to Georgette Gilmore, communications director and project coordinator for the MFEE. She provided a little more insight into the Toast to the Teachers fundraiser and detailed the exact role of the MFEE. “Montclair Public School families host between 75-90 Toasts every year to raise funds for MFEE and to honor their amazing educators. MHS senior Noah Gale and his family are hosting “Salutes To The Superintendents of Schools!” to honor Barbara Pinsak, the district’s last Interim Superintendent, and Dr. Kendra Johnson, our newly hired Superintendent. Noah, the district’s biggest cheerleader, had been planning this since last year. The Montclair Dispatch was also able to speak to the new superintendent for the Montclair Public School district, Dr. Kendra Johnson. She voiced her support for the MFEE and the projects that they tackle.